KAMPALA– High Court Jane Frances Abodo has declined to grant bail to the key suspect in the Entebbe women murders. Ivan Katongole, a businessman dealing in the exportation of fish had applied for bail pending the hearing of his case in which he is facing a charge of murder of a one Rose Namuli a former hairdresser at Mpala village. “The chances are high that the applicant (Katongole) might abscond from court once released on bail because of the gravity of his murder case which attracts a severe sentence of death,” Justice Abodo ruled. Through his lawyers; Caleb Alaka and Evans Ochienge, Katongole had listed several grounds for his bail application including the fact that the DPP has indefinitely held him on remand on claims that he has fresh pending murder charges against him. Other grounds for bail are that it is his constitutional right to be released on bail, has a permanent place of residence at Nkumba- Kigero for which he has also produced a title as security in court. “Since there is no allocated date for him to appear in court to face the new charges, he is afraid that his right to a fair and speedy trial is in jeopardy,” Mr Alaka had submitted. Katongole had presented 3 sureties including his father Rogers Kaweesa and 3 friends as assurance that he will return back to court once released on bail. However, the DPP through state prosecutor Nelly Asiku opposed Katongole’ s bail application saying there are high chances of him absconding since he is charged with grave offenses that attract a maximum sentence of death upon conviction. “The letters of introduction brought by Katongole’s 4 sureties are not authentic because they don’t bear signatures of the current village leadership. The court should just make orders that Katongole appears in court for trial instead of releasing him on bail,” Mr Asiku said. In the new charges, the DPP alleges that Katongole murdered another 17-year-old girl known as Sarah Wanyana a resident of Jjumba central. 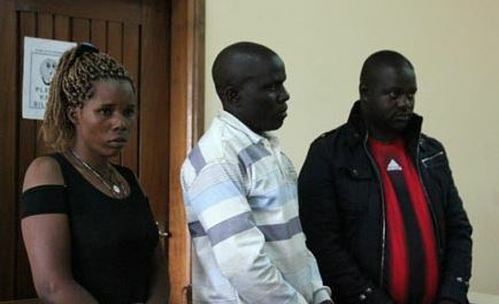 Police then on July 24, 2017, arrested Katongole and 2 other people; Hellen Nabagala and Andrew Kizito as suspects in the alleged gruesome murder and the 3 are currently held at Kigo prison awaiting trial before the High court at Entebbe.